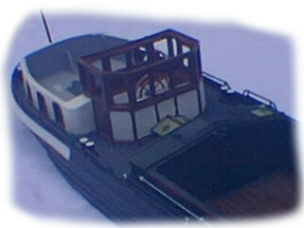 Artitec kits and the making of the Rhine motor vessel. 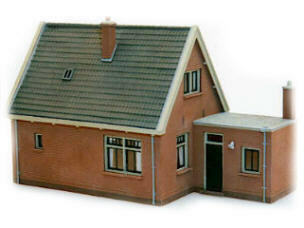 The kits from Artitec are different compared to the more classic kits from Walthers and Model Power. 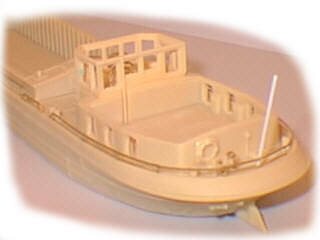 Instead of molded colored plastic parts, it is made from cast resin. Working with resin is done different then with the classic plastic kits. The kits have to be painted as well, once build. Even though it appears to be hard to build a resin kit, it actually is easy. The result might be better then a classic plastic kit. 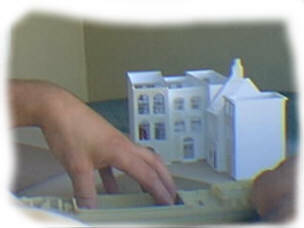 This article is about how to build Artitec kits, or any other manufacture of cast resin products, for that matter. When you have made a selection for a model kit, and open the box, you notice their are not that many parts. This is due to the fact that most of the details are cast in its place. 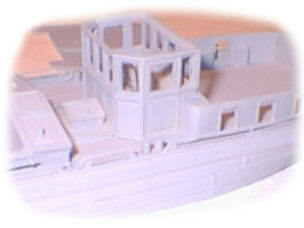 Artitec has a huge assortment of kits, structures and ships. In this project I discuss the making of an Artitec ship. 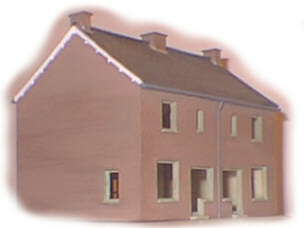 The procedure of building a resin kit is about the same for any kind. And if you decide to purchase an artitec kit, they come with well-detailed instructions. I advise to work in a well-ventilated area, since working with resin, especially sanding, creates a powder resin dust, which is not healthy. I for myself like to work outside on the patio. 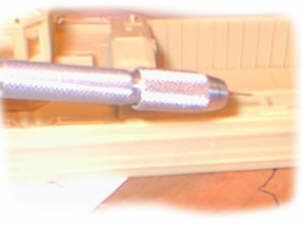 When subscribing to the railroad magazine Rail Hobby, new subscribers received a free Artitec kit, which was only designed for the Rail Hobby magazine. 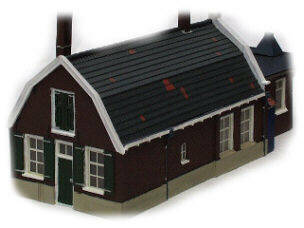 This was a model of a signal tower from the city of Doetinchem. 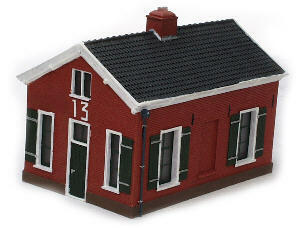 This model is out of stock and replaced with another Dutch model, block post 13. 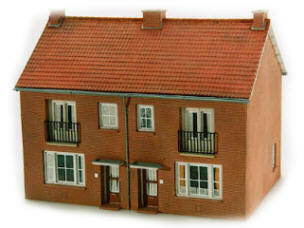 If this one is still available trough Rail Hobby I don't know, you can best contact Rail hobby them self. They do sell the kit to non-subscribers, with a slightly higher price. This is a nice way to start with Artitec kits, when subscribing to the magazine, but since the magazine is in Dutch, you probably won't go that route. I started with Artitec that way myself. These are pictures of the signal tower and block post 13. 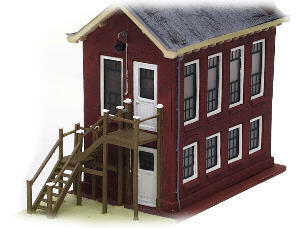 This signal tower was my first Artitec kit. When I opened the box, I was a little surprised with the contents. How do I turn this into a nice structure? And how to paint those colors, as seen on the box? You can see that it turned out all right, by looking at these pictures. Check the details that are caste in the resin. As mentioned earlier, when you do decide to purchase an Artitec kit, it comes with a detailed set of instructions. A manual for working with resin in general, a manual for the model it self, as well a manual with clear painting instructions. 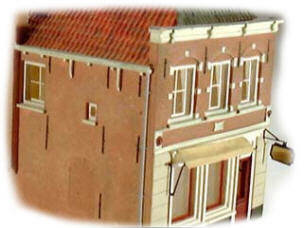 Following is a brief description how I made my Artitec models. 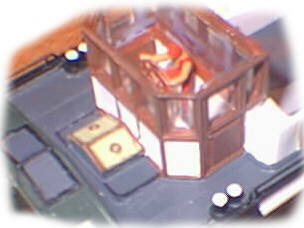 First the parts are not molded like the plastic counterparts, but are laying next to each other, on a flat surface. If some of the parts are warped, laying the parts in hot water can true them, this will soften the resin. Also with the use of hot water some small parts can be removed from the carrier, as it softens up and is then easily cut with an X-acto knife. I attach two sheets of sandpaper, one fine and one course, to a smooth flat surface sheet of wood. 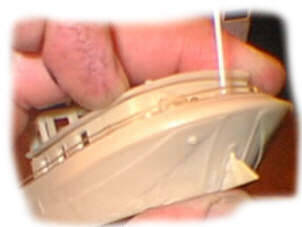 Cast resin parts are separated one from another by sanding them. Some parts can be cut with an X-acto knife, but this have to be done with care, since it breaks off easily. You can sand the resin with a light and even applied pressure on the part. When quit a bit resin has to be removed I start with the course sandpaper and when I get close to the measurements, I continue sanding on the fine sheet. This process takes most of the time and controls the proper fit of each individual part, so a little care and patience is advised. When all the parts are sanded and finished, I check to see if they fit nicely with each other. They may need further attention with a small file or careful sanding. 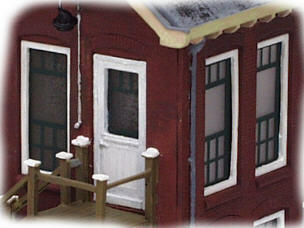 When sanded according to the provided instructions, the openings for windows and doors are clean from resin. They may have to be filed with a small file, but this might be done later, after gluing the parts, study the provided instructions first. When all the parts fit nice, I clean them in water with liquid dish, and as they dry, I clean the worktable from its resin dust, so we have a clean area when we start gluing the parts together. Resin is glued with super glue. First I hold the parts against each other, mostly with my fingers, but sometimes with some tape. Carefully one drip of super glue and check to see if the two parts are fitted together properly. The use of just one drip of super glue allows me to move the two parts in a better-fit, if need to. When it fits perfect I add a few more drips of super glue and it is tight. 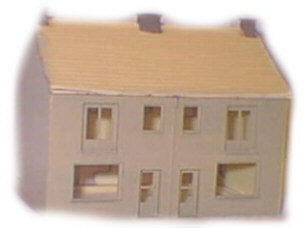 With the classic plastic kits you have more time to make changes, if it don't fit as nice as it should. 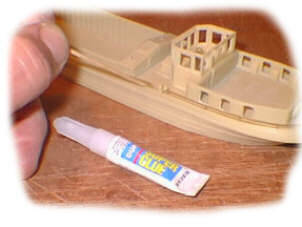 Incase the parts have to be separated and re-glued, the old super glue will have to be removed from the resin, otherwise the new glue will not hold. When all the parts are glued the model is almost finished, there is not as much gluing to do as with the classic kits. The result is visible...a plain simple model? New the fun of working with Artitec kits starts. After washing the structure again, it needs to be painted, and believe me it is not as hard as it seems. During the painting you notice many details, they will make the model come to live. 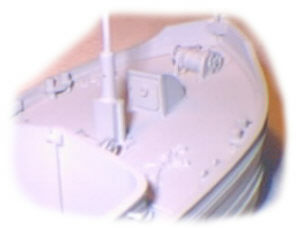 At some models small fragile brass parts have to be installed also. After learning and getting some experience with the making of some Artitec houses, I started with a ship. Viewing photo's on the Artitec website, it promised to be rich selection and plenty of details. 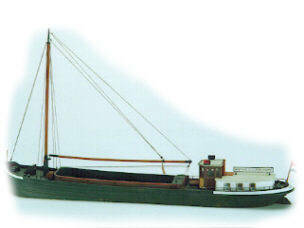 Finally I choose the Rhine motor vessel. 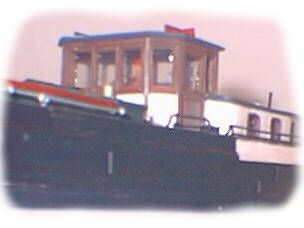 A typical Dutch model which can be found at every harbor, channel or river in the Netherlands and abroad. There are not that many resin parts, the vessel is almost caste in one piece. 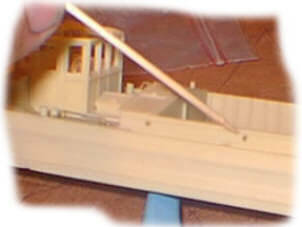 The steering hut, the roofs from the deckhouse and the cargo area, as well as the masts are individual resin parts, and are to be prepared as described earlier. 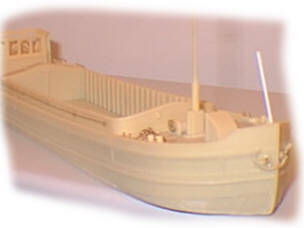 This model, like the other ships, contains a lot of small brass parts. For me this was a something new, except for a brass / white metal train car, but that was some 15 years ago. The ship has to be flat and true at the bottom. Sometimes it can be warped, but according to the instructions this can be straightened by holding the resin part under hot water. My retailer however wanted to sell me a true flat one, just to prevent possible trouble, hence I bought it in Holland, and live in the USA. At this picture I am sanding the bottom of the ship, and in the background you see my city block from Dordrecht. How the resin parts are handled I described earlier. With the next pictures I show how the brass parts are done. The brass parts are very small, so sometimes it may be necessary to drill the mounting hole to a better fit. I have a special tool for this job, and it holds small drills. The tool it self is about the size of a small screwdriver. At the photo above you can see this drill. It is drilled by hand, a dremel power tool is too heavy, I think. It also rotate to fast and the drill could walk away from the place to be drilled. To remove the brass parts I use a small side cutter. This one is specially designed to cut very smooth on one side, without any damage to the part. Just make sure you don't loose the small part, once it's cut. 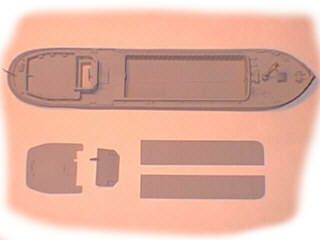 The photo's below show the small part, an eyehook, which is installed into the resin ship, with the tweezers. The mounting hole is prepared with the drill as mentioned earlier. When the eyehook is installed straight and deep enough, it is secured in place with a drip of super glue. The super glue is on the toothpick. After installing five eyehooks on each side, a thin steel wire is installed trough the eyes. In my kit the steel wire was bend and twisted, which I could not straighten any more. I replaced this with another steel wire. 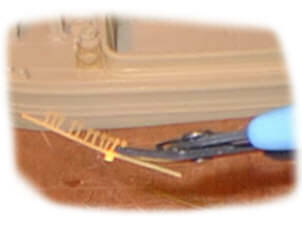 By super gluing the wire in the first eye, and continuing with the other eyes while applying some tension on the wire, you get a straight, tight wire. 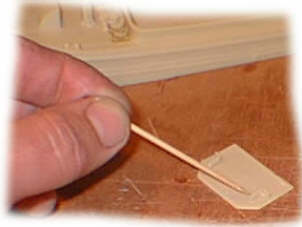 Also the brass rails is glued with superglue on a toothpick. 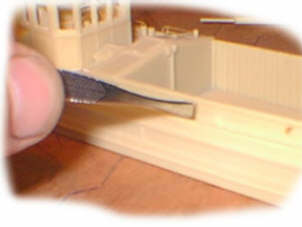 When the superglue is applied directly out of the tube, it will dispense too much glue and close the cap from between the ship and the rails. This is extremely noticeable after painting. 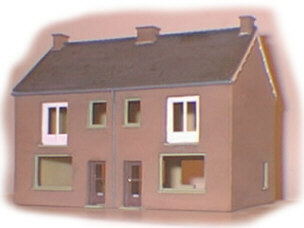 Some small resin parts are to be mounted on the roofs, in the same way, as shown on the photo at right. The roof of the deckhouse has to be shaped in a curve. The way to do it is by placing the roof under hot water and bend it in shape, as it soften the resin. However it kept going back out of shape. When I took this picture I had not yet filled the sink with hot water, but afterwards I did and kept the roof under water fort a while to get the shape I wanted. Finally it reached the proper shape, as you can see in the photo at right. This will not be glued yet, like the other roofs. The cargo area can be modeled closed or open. 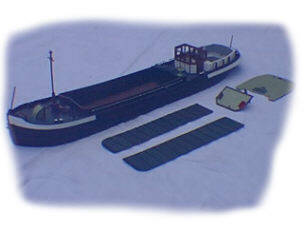 I don't know yet how I will model a scene on my layout, loading in a harbor, or traveling in a river. Therefore it is still open. New the model is ready to be painted. When it is cleaned and free of grease, I spray a coat of primer on the model. See the following pictures, blank and primed. 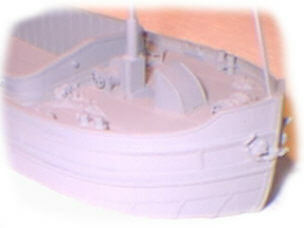 What can't be seen on these pictures is visible after spraying primer on to the model. 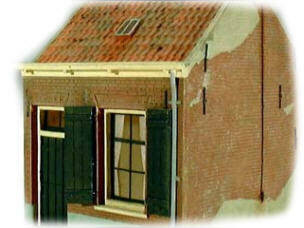 Defects or damages can be seen and fixed. After priming and examination, the real painting can start. Usually one start with light colors and then the darker colors. I started with the inside of the ship, this way I can hold the ship in my hand. When the inside is finished I painted the outside. The white sections at front and back I painted at last, over the black paint. 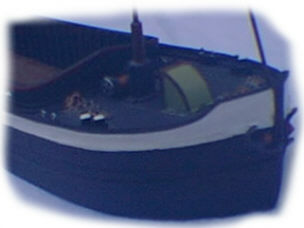 After many hours, evenings, of painting the model finally looks like a real ship, as seen on this picture. However, the model is not finished yet. With rub on letters I have a placed my mom's name as the ships name on the front. This is the hardest job, to place the individual letters perfectly next to each other and with the right pitch. Since my mother is born in Rotterdam, the ship is registered in Rotterdam, which I placed on the back of the ship. Two more pictures of how she looks right new. Interested in an Artitec kit? Visit this Dutch Internet store, where you can make a selection online.